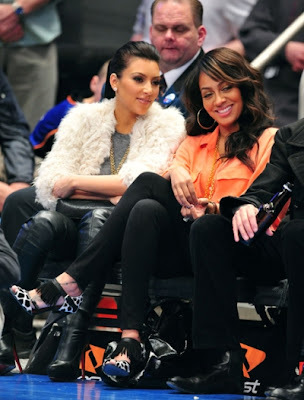 LaLa Vazquez and Kim Kardashian were cheered by fans as they walked across the court at the Milwaukee Bucks Vs New York Knicks Game. Oh...to get another reality star, Angela Simmons! Kim, no doubt like pictures. the ladies enjoy the view...Hey Kim, your man plays for the other team in the area....ya know at the Izod Center. And yesterday, their other BFF singer Ciara was at the Knicks...as they finally squeezed a win out of Orlando. She shows a fan the phot she took. 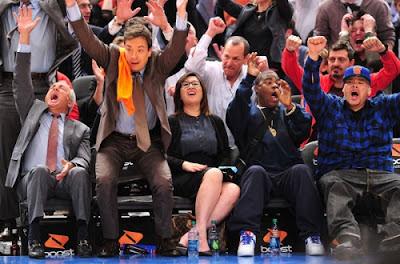 Jimmy Fallon, Tracy Morgan and Fat Joe cheer the home team. Tracy is trying to talk to Fat joe...but he's preoccupied. 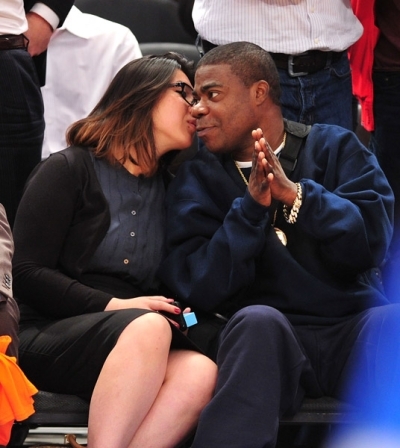 Tracy Morgan listens to his girl.